What is a vampire’s favorite sport? And here’s one for all you “Twilight” fans out there…. I hope you (and your kids) have a wonderful holiday! This contest is now closed. Thanks for all the comments. First: the Mormon Tabernacle Choir’s new CD. This is an absolutely fabulous CD that was made from Sissel’s performances last year with the Tabernacle Choir. If you’ve never heard her sing before, you are in for a treat. You can listen to her here. And you don’t have to be Mormon to appreciate and love the Mormon Tabernacle Choir. This CD is for anyone who loves good Christmas music. Of course, I find myself especially partial to tracks 1, 12 and 16, since those are the songs which feature the Bells on Temple Square. If you don’t win this CD, you are really going to want to go out and get yourself a copy (unless I have your name for Christmas -wink, wink). 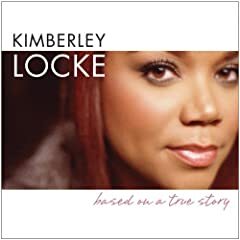 Next I have a Kimberly Locke CD. This is actually a promotional CD and it is signed by Kimberly herself. It includes “Changes”, “Band of Gold”, “Supawoman”, and others. If you are a Kimberly Locke fan, I’m sure you’ll love it. 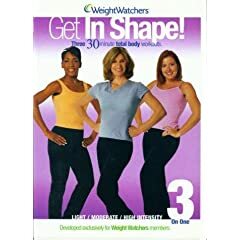 And lastly I have a set of three Weight Watchers Work out Videos. The first one is opened and I have actually used it. They do some fun moves and it’s a nice workout (even if the blonde lady in the middle has kind of weird hair). Since our VCR was a bit spazzy, I did not try the second and third videos, and I’m much more of a social exerciser and don’t do all that well with videos. So, if you’d like to win this set, here’s your chance. So, please leave a comment and you’ll be in the drawing for all three prizes. I will accept your lovely comments until Friday November 2 at 7am. Then we’ll draw. Fun fun Fun for all! And don’t miss all the contests going on at the Fall Bloggy Carnival hosted by Shannon. Yesterday I did my very first 5K! Shocker, I know. But I wasn’t in there for the competition of the thing, but simply to prove to myself that I could actually do it. It started back when I walked four miles to my friend’s house and back, and my friend Lisa saw me as I was coming home. She suggested this Halloween 5K, and that wouldn’t it be fun to get a group of us together and enter this race. Well, fun was not the word I would have used, but she did get me thinking. So I’ve been trying to include 2-3 mile walks in my routine, and this past week I was hoping to do 3 miles three times. I actually didn’t reach that goal, but I did 2 1/2 miles on the treadmill on Monday, and then 3 miles on Wednesday. So I knew I could physically walk that far (3.2 miles or something like that), but I don’t go fast at all. So we went over to the rec center last night, donned in my workout gear. We picked up our t-shirts, pinned on our numbers and got our free glowey necklaces. No costume for me, although I did wear a blinky LED necklace, and a blinking hat to be festive. One of my friends showed up in a purple wig, and the other was wearing a cute little witch costume over her clothes. Some of the people there were REALLY dressed up! There was a member of the band Kiss (he looked just like the one on the right, only skinnier), complete with tight black pants, white makeup, long black hair and major platform shoes. I don’t know how he did the race in those shoes, but I guess he did. There were two guys dressed as “snorkelers”. They had on full body wetsuits, masks and snorkel gear, and both were holding inflated innner tubes. I asked one of them if he had run the whole race with that snorkel tube in his mouth and he said he did. He said the hardest part was that the mask kept fogging up and he couldn’t see where he was going in the dark. He just followed the glow necklace of the person in front of him. I had already been assured by one of my neighbors that she was NOT running, and she wanted to make sure she’d have someone to walk with and not be left in the dust by our running friends. I agreed to walk with her, since I wouldn’t be doing any running, either. But this friend walks 3 and a half miles every morning with her dog. What was I thinking? As we started out, we did actually jog for a while, but that was mainly so we wouldn’t be run over by the throngs of people behind us. After everyone spread out we slowed to a brisk walk. Her brisk walk is about my fastest walk possible, with a few paces of jogging thrown in every once in a while to keep up. I’m sure I was not the most pleasant walking partner (she’s used to the company of her dog, after all), but we talked the whole time, and she got a good laugh when we went through the cemetary and a very very tall man crept up on us to scare us. I kept asking her if she thought we were almost done, and when the people directing us said we were just over 1/2 way, I said a little too loudly “You have GOT to be kidding!” But I made it. I did the whole thing, and came in under 50 minutes. My friends were there cheering at the finish line, and it made me feel good. I had not tripped, passed out or gotten lost along the way. Oh, and I came in #245, if that means anything. 245 out of what, I do not know, but I know there WERE people behind me, so I wasn’t dead last, at least. When it was over, we went back into the building to find some water and eat a banana. We also picked up our little goodie bags with raffle tickets in them and then went to see if our ticket matched any on the prizes. Oh, Goodie!, I thought–contests! Yes, I won……a water bottle. Wow. Since there weren’t many people left, they let us pick a second goodie bag and see if that had a winning ticket, so I picked another one. Sure enough, I won another water bottle, so I gave it to a friend. DaNae, who had been one of the ones pushing us to do this, WON first place in her age category (which was also my age category, and I looked to be about 17th, by the way). She was very excited about this win, and assured us she was going to mount this ribbon and frame it. So, overall it was a good experience. I would probably do it again, if pressed upon to do so. I’m proud of myself that I could actually do something like this. So, if I, an almost 40 year old overweight, out of shape mother of 5 can do it, you could do it, too. I’ve had some pictures I’ve been wanting to post for a while, so today’s the day. Does this ever happen to your rolls? I’ve had three cans explode in the past few months. Weird. Remember my cool playground cover that I sewed in the spring? Well, here’s how it looks now. It didn’t even last 6 months before the wind shredded it! Frustration. Have you even seen the bathrooms at the Grand America Hotel? They are fabulous! Here’s the tomato juice that we put up this year. It makes the best taco soup! Here’s the big big tv in it’s new spot after we got things organized. Of course to get to that point, first things looked like this: and my kitchen table looked like this, since we had to take everything out of the shelves and cupboards, and since we lost the center section, there’s that much stuff that didn’t have a home. And here’s a couple of my favorite pictures from Ryan’s birthday. We were driving to St. George that day, and we stopped at a little Mexican Restaurant in Cedar City for his birthday dinner. The food was NOT great, and I wouldn’t recommend it, except for the birthday treatment. They brought out fried ice cream and sang and put the birthday sombrero on Ryan. All the kids loved that! and even Mom got a turn to wear it! And if you still haven’t seen enough pictures of our family, feel free to click here to see Disneyland pictures! My bathroom has been smelling a bit like a four year old boy and his friends frequently use it for the past few days.Ã‚Â So today, instead of going to the store to return the two pairs of pants that I bought for my poor flood wearing son (you should see him at church, the poor thing.Ã‚Â He’s grown out of all church pants! )–the size 14’s that are not big enough for my 13 year old son.Ã‚Â What? Anyway, I decided to stay home and clean the bathroom.Ã‚Â And it’s a good thing, I did, since that same flute forgetting son called me and asked if I could bring him his flute (AGAIN! ), and since I’m coming, would I mind bringing him his lunch?Ã‚Â Errg.Ã‚Â Anyway, I did get that bathroom cleaned.Ã‚Â And it smells so good!Ã‚Â Don’t you just love it when the whole bathroom is clean?Ã‚Â The toilet, sink, shower door, mirror and even the floor are all clean.Ã‚Â Until the kids get home at 3:00.Ã‚Â So, if you were planning on visiting me in the next hour and a half, you would be treated to a nice, clean, crisp, bleachy smelling bathroom.Ã‚Â After 3, all bets are off. Now I’ve got to go and vacuum the family room–hooray! While looking at my son’s grades on powerschool and realizing all the assignments he has not turned in, I came upon an idea.Ã‚Â Instead of printing out assignment lists for each class, which is yet more paper for him to lose in his backpack, I grabbed a stack of post it notes and just jotted down each missing assignment on each post-it.Ã‚Â He is then able to take those notes and when he findsÃ‚Â the assignment buried deep in his backpack, he sticks the note on that assignment and can show it to me, so I can check it out.Ã‚Â It seemed somehow easier for him to manage those little notes, and he has a visual reminder of what still needed to be done.Ã‚Â The assignments that he couldn’t find, he stuck the reminders on his binder. I also love post-it notes for leaving reminder messages for the kids in the mornings.Ã‚Â “Take a shower”, “don’t forget to wear warm clothes today” or even “I love you”. So, that’s my works for me idea for today. For more great ideas, visit Rocks in my Dryer. You know when you are a kid people ask you what you want to be when you grow up? I wanted to be a veterinarian. Then I wanted to have a pet store and call it ‘Paige’s Pet’s’. Then I wanted to be an actress and a singer. Then I wanted to be a teacher. Now I’m a mom. It’s really a combination of all of those jobs, along with a doctor, psychologist, maid, chauffeur, cook, party planner, nanny, wet nurse, costume designer, tutor, and personal assistant. I really enjoy my job as a mother. I love my kids, and I get joy out of keeping my house running semi-smoothly, and taking care of my family. But that leads me to my question for you today.Ã‚Â What’s your dream job?Ã‚Â Do you already have it?Ã‚Â What would you really love to do if you could?Ã‚Â Be a firefighter?Ã‚Â A doctor?Ã‚Â Operate Space Mountain at Disneyland?Ã‚Â What’s your dream job? The other night, the phone was ringing. I was asleep already, but from the depths of my grogginess, I heard it ring a couple of times before my non asleep husband who was working downstairs answered it. Then I heard it ring again. Hmmm. I went back to sleep. When it rang again at around midnight, I knew something was wrong. Someone is hurt. Someone MUST be in the hospital or dieing, right? I stumbled downstairs to ask Ryan what was going on. WRong number, he said. What? Then why does he keep calling once he knows it’s a wrong number? Ryan said he didn’t speak English and he kept telling the guy that this is the wrong number and to Please stop calling, but he kept on calling us. And he’s called again the next day! And the next! I’m wondering how I can block just that one number so he can’t call us again. Do any of you phone savvy people know how to do that? I’ve also been receiving calls from the Census Bureau. They sent me that huge packet to fill out, and of course I didn’t get to it right away. Then they started calling and asking if I could just spend a half an hour and answer the questions over the phone. Well, that motivated me to just fill out the packet and send it in, so that they would stop calling me. But then even AFTER I sent it in, they kept calling. We haven’t received your information, and it’s getting close to the deadline, they would say. BUT I sent it IN! 4-Go to the school and get some reflections reminders copied, then put them in the teacher’s boxes. 5-Go to the grocery store and buy carrots, snack size baggies, and yogurt. Oh, and toilet paper. Must not forget that one. 10-Start on Natalie’s Halloween costume. Yes, I know I’m getting a late start, but I thought all the kids could just wear costumes that we already have. Silly me. 11-Find some kind of a musical concert that Cole can attend before next Thursday so that he can write up a concert report form. So, there you have it, folks. My all important list. I’ll come back here and update when I get these things crossed off, so I can share in my joy. Wish me luck. And good luck on your lists today, too. My little girl has braces! She went in on Tuesday and got the braces on the front four teeth (top and bottom). She’s also got some little spacers in the back so she can get a herbst (?) appliance put on in two weeks, that will help pull her bottom jaw forward and help even out her overbite.